A three wing cutter set for fast production of matchline or TG & V boarding. The set comprises an arbor with three cutters and a bearing. The set is used with the slotter in place to produce the groove half of the joint. The slotter is then replaced with the bearing to produce the tongue half. The cutter may be used freehand in a router, with a fence fitted to control the depth of cut, or alternatively with the router mounted in a table. The cutter can accommodate timber thicknesses of between 12mm and 22mm with the chamfer size varying from 2mm - 5mm respectively. The tongue is 5mm thick x 8mm wide. 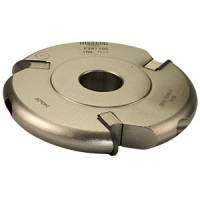 This cutter set can be converted to a double chamfer (add T5560D) or no chamfer (add T5560C) by purchasing replacement parts. Click the link below for more details. THIS IS A LARGE CUTTER SET AND SHOULD BE USED AT 12,000 RPM MAXIMUM.